Summer marks the time of the year when pests will be at their most active, and also is the time for homeowners to be most vigilant. If you see pests now then it can be an indication of a bigger problem that should be addressed as soon as possible. Rodents: Rats and mice are at their most active and their populations increase dramatically. Look out for droppings both inside and outside your home. Cockroaches: Cockroaches thrive in the hot and humid Ohio summer climate. They search for food and water, and depending on the species like to live inside or around the outside of your home. As they carry disease and allergens any sighting should be dealt with immediately. Carpenter Ants: Carpenter ants chew through wood to build their nests and have the potential to cause serious structural damage to your home. They prefer damp and decaying wood and you should be on the lookout for the trails of sawdust they leave. Mosquitoes: Mosquitoes have been in the news with concern over the spread of the Zika virus. While there are confirmed cases in the United States all have been contracted while traveling to infected countries - none were contracted within the US. More information can be found on the CDC http://www.cdc.gov/zika/index.html Mosquitoes in general breed in standing water so homeowners should drain standing water were possible and empty and clean buckets and other containers that will collect and hold water. Bed Bugs: If you travel and are staying in hotels this summer always check for bed bugs. Inspect the mattress and under the sheets for the tell tail signs - spots of blood, feces and eggs. Be careful as they will "hitch-hike" on your clothes and luggage and return home with you. Fleas: The hot and humid summer in Ohio is perfect for fleas; they emerge around March and thrive through to November. Check cats and dogs for the quick moving fleas, their eggs, and bites and black feces which turn red on a damp paper towel. 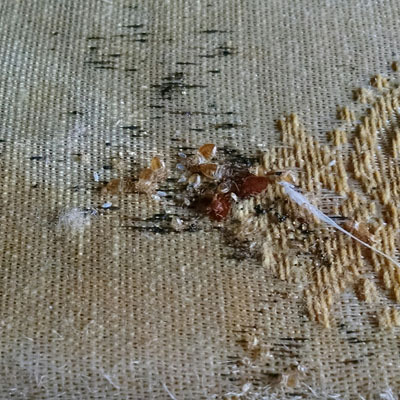 Fleas are usually brought into your home by your pets so check their bedding for eggs and larvae. Wasps/Bees: Carpenter Bees, Wasps, Bees and Hornets will build nests all around your home given the opportunity. While not all varieties sting they can invade and cause severe damage to your home. Check around window and door frames, under eaves, fascia and siding. If you have these or any other pests, call us now on 440-428-1482 or 1-800-686-2847 and we'll give you a free estimate right over the phone. We only use EPA approval materials and all of our work is guaranteed! It's Spring Time! Don't Delay Call for your May appointment TODAY! Spring is the time when many pests wake from their winter slumber. As the temperatures rise they become active looking for food, mating, and building nests and most likely will invade your home! Stinging Insects: Carpenter Bees, Bees, Hornets and Wasps like to build nests in and around your home. They could be found making their nests around your window frames, under eaves, fascia boards and in under the siding. Not all varieties sting but you BUT they can destroy and invade your home. ** We provide a bee/wasps prevention program starting in May - so call for your appointment now to assure you don't miss out on this popular program for our customers! Ants: Carpenter ants will cause structural damage to your property by hollowing out timbers; they build colonies in damp and decaying wood. Smaller pavement ants, while not wood destroying, have outside dwellings and may venture inside looking for food. Termites: These wood-destroying insects will cause structural damage to your property resulting in costly repair bills. Termites swarm in Spring looking for mates and a place to form a new colony. If buying/selling or refinancing your home please call our office for an inspection. If you think you may have these or any other pests don't hesitate to call us on (440) 992-7888 and we'll help rid your home of them before they have chance to get established! We service all of Lake and Ashtabula counties in Ohio and will be happy to discuss your needs and give you a FREE PHONE estimate (excludes termites and/or bed bugs - on premise inspection required). Bed bugs used to only be a problem in the developing world but for the last few decades the number of infestations has risen dramatically across the developed world including the United States. This rise has been attributed to factors including international travel and new safer pest control methods that do not harm bed bugs. 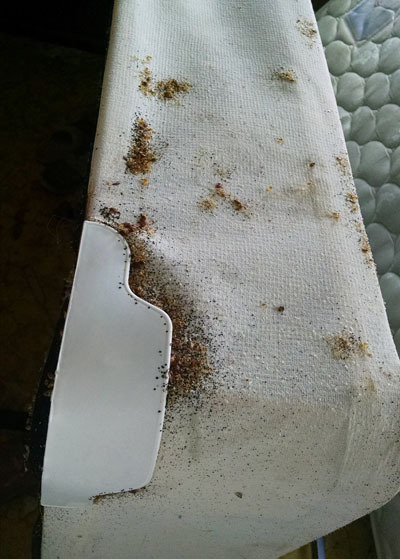 It was once thought that bed bugs only caused problems in dirty and poorly maintained environments but an increasing number of infestations now occur in relatively clean and well maintained conditions. We use only EPA registered chemicals to CONTROL bed bugs, but is it important to maintain cleanliness to help prevent further infestations. If you think you may have a bed bug problem - don't panic - GIVE US A CALL TO DISCUSS YOUR BED BUG ISSUES AT 440 428 1482 OR 1-800-686- BUGS (2847) AND WE WILL BE HAPPY TO ASSIST YOU. "Hi Laura, I just want to thank you for getting our house treated before our cruise. It would have spoiled the trip for me. Your exterminator was very friendly, helpful and informative. I will surely recommend you guys to others"
"Thank you again for volunteering to speak at Braden Middle School's Meet the Professional. The staff and students were very excited and Mrs. Pfeifer felt it was a huge success. The students were very impressed with your board of bugs!" "Thank you so much for your assistance and going out to spray our house the same day I called, in a panic I might add. We found it outstanding that you came to our aid so quickly. All the fleas have been dying off just like you said!